Origami Crane Couple - Origami is the Japanese word for paper folding. Ori means fold and gami means paper. It is the art of paper folding that has been handed down from parent to child through the generations. 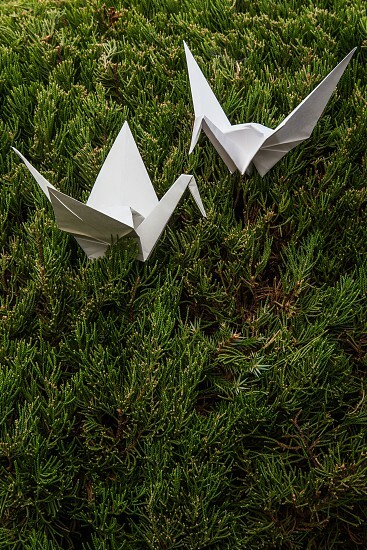 Origami normally involves the creation of paper forms by folding likenesses of animals, birds, fish, and geometric shapes. The most common are that of cranes. Even young children learn to make them. The custom originated in Japan when gifts were decorated with nosh which had intricate folded patterns to adorn gifts. Japanese elementary schools often have origami as part of arts and crafts classes but it is most commonly taught at home. Traditional origami has been in practice in Japan since the Edo Period. E sometimes cutting the paper or using nonsquare shapes to start with. The principles of origami are used in many Japanese designs, including industrial ones.